VIVA Las VegaStamps! sent us each a sheet of their rubber stamps. I received the December Daily, titled Plate 1430 which is perfect for what I do in my own Daily! Numbers... Words... A Little Alphabet!!! It makes my Heart Sing!!!! Azure, Timber Brown, Black Cherry, and Midnight Blue. A little variety always adds interest. I just wanted the cute little alphabet for this one. The other parts of the tissue paper are being saved for my DLP for December! Washi Tape, PanPastels, Posca Pens, Distress Inks, paints and markers. Smack dab in the middle of the left side page is the August StencilClub Swirly Doodle. On top of that is the Bullet Holes Stencil by Terri Stegmiller. For a little metallic shine. with Posca Pens, markers and paints. to see what each of the design teams are doing. Leave comments on all the blog posts for more chances to win the giveaway. What PERFECT stamps for your daily! Love this! very cool, I'll have to try the tissue teqhnique for my journaling!! Loving the texture here. Beautiful! My daughter used to sing this song when when she was tiny so the memory evoked and the bright colors of this page really makes me smile. Love the colors! Great project. Love that song! Your canvas has so much to see! 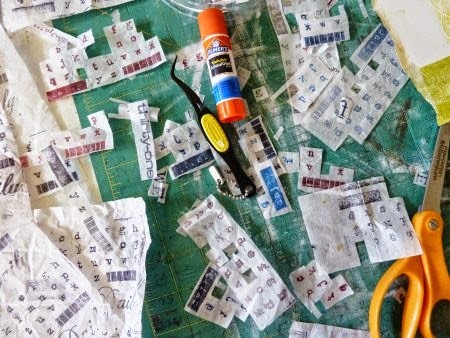 I like the fun technique idea of stamping on tissue and then sticking the letters you want onto your project. Never thought of that before! Makes me start thinking about my stamps in a whole new way! That stamp rocks! I need it! Love your pages, Janet. I always get such inspiration from you. Thanks for sharing. love this stamp and what you did with it--amazing results! The song reminds me of my grandmother :) Like Kirsten said, great idea to stamp on tissue!!! I will try that one. 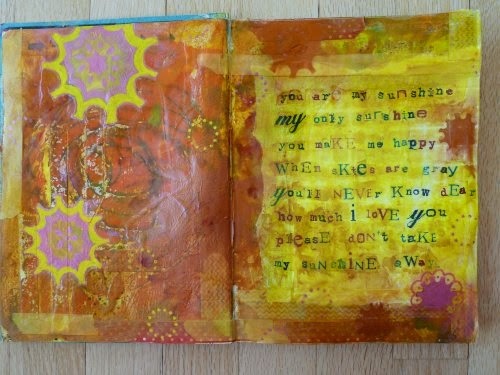 Gelli plates are very popular and look like a lot of fun too. Unfortunately can't see Natasha's blog entry. Love how you used the plate whole! This turned out so cool... both the plate and the bulleted holes stencil just went on my wishlist! Beautiful page! Love how you used the stamps and stencils so artfully! Love how you stamped all those letters on tissue and then created with them. Such a happy color scheme too!! A great use of stencils and stamps! Love the journaling. Lot of work but so worth it in the end. The background really shows off behind the sentiment. The rest of the colors are so pretty with their embellishments. Great project. Great piece! I learned more techniques again today. Thanks for being a part of this wonderful blog hop and sharing your talent and creativity! gorgeous! thanks for showing how you did this - mind-blowing. Really such a happy vibrant page. Love it. LOVE that...bright and beautiful and UP. A great start to my day...and the hop. great page. I love that plate(especially the alphabet). so many uses for it. This turned out really cool! The bullet holes stencil just went on my wishlist! Lovin' that alphabet stamp set, too. I really love how this turned out! Great song with lots of memories attached. Love your samples and love those stencils! I can't believe you took the time to write out that entire paragraph with individual stamps. Looks amazing. My mother's favorite song! and illustrated beautifully. This is such a happy journal spread. Love it!!! My favorite song. Now if I hear it in my brain at 3:30!am I will see. that took a lot of work. just amazing, great colors. LOVE your process and the colors! great job! Love how you changed the bullet hole stencil. Thanks for sharing. This is a special song between my husband and daughter so "you are my sunshine" has very special meaning in our household--your layout is beautiful! Makes me smile just to look at it! 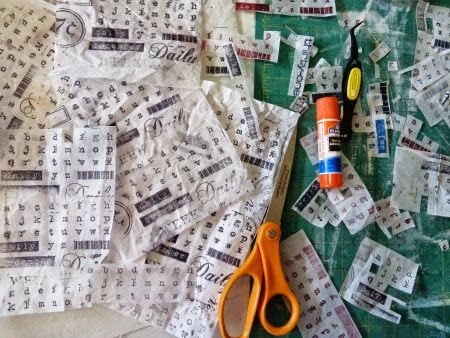 I love stamping on tissue paper, your page is fabulous! Love how you used your stamps! stamping on tissue paper....haven't done that in years. your journal page is looking good. Janet, you do the most fun posts. Love your pages. fantastic pages in amazing colors! I love everything about this spread!! Love the gelli print background and how it enhanced your stamping. Such patience to do all that. This is cool; I'll be interested to see what you do in your DLP when the time comes. This is really awesome!!! I love the colors! I really like everything about this spread, the colors, the stamps and the stencils. it is so inviting. Great colors. Love it all! Love Love Love!!!! I cannot even begin to say how perfect this is! You have made me want that stamp set in such a big way Janet! Love what you did with it! Loving your journal pages!! Especially that you did a song!